« Profit Leaders vs. Laggards – It’s Your Choice! 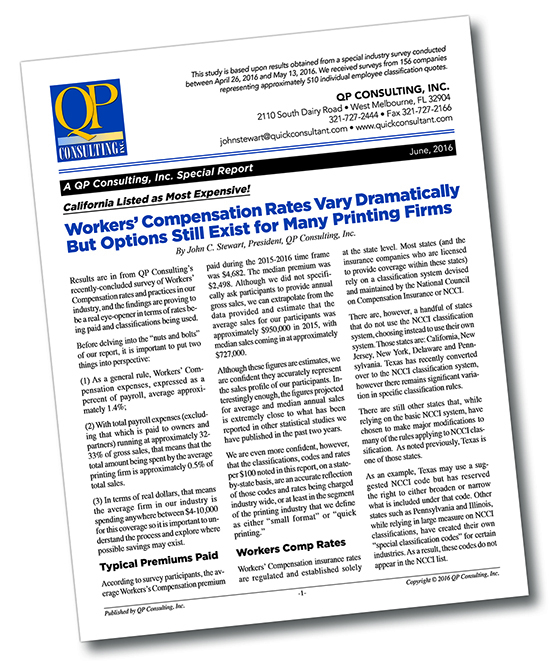 Workers’ Compensation rates vary dramatically according to a special 11-page report just-released by QP Consulting, Inc. However, contrary to popular opinion, owners still have options, to control or even lower annual premiums. The new industry report includes a number of charts and graphs, including a special table detailing 35 states and the most common codes and NCCI rates per $100 for the four major classifications available in the printing industry – Clerical, Sales, Printing and Delivery. Our Latest Publication allows printers to check a special table and compare how employees working for other printers in their own state are being classified, as well as the range of rates being paid. More than 150 firms participated in our recent survey, providing classification rates for more than 510 employees. CA, CO, FL, GA, HI, IL, IN, KS*, KY*, LA, MA, MD, ME*, MI, MN, MO, MS, MT*, NC, NE, NH,NJ, NM, NY, OH, OR, PA, RI*, SC*, TN, TX, VA, WA*, WI, and WV. Note that “*” indicates four or less firms reporting for that state. Copies Mailed to Participating firms – Copies of the new report have been mailed to all participating firms on June 3, 2016. Firms wishing to purchase this information-packed report (Priced at $42.95) can place their order by visiting our Bookstore. All publication orders are processed same day as received and sold on a 100% money-back guarantee.